SGP + PHD2 "Pause guiding during autofocus" issues? 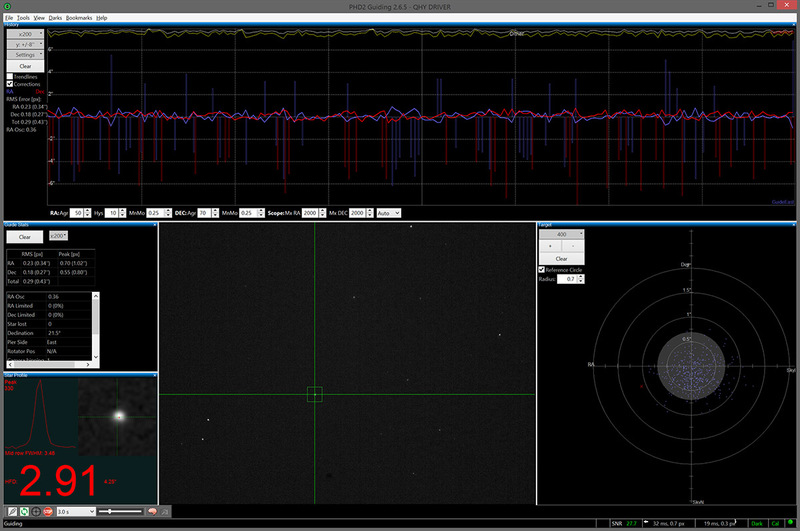 I've been trying to get my new imaging system working smoothly tonight. Had a few kinks to work out...not the least of which have been related to PHD2. I had some very strange behaviors, including full on sine-wave oscillations in both axes that occurred at random, or in response to larger guide pulses (i.e. dithers). One of the issues I am running into is pausing PHD during autofocus. I've got the option enabled, but PHD just seems to keep clocking along while I autofocus. Not only does this wreak utter havoc on the graph, it also leaves me with extended settle periods after an AF run. Between the various PHD issues, I've lost the entire night so far. I've updated everything to the latest. I'm on the SGP 3 beta .170, latest PHD2, latest drivers for everything. The sine waves seem to be due to bad calibrations. Odd thing is...the calibrations appear to be valid when they are first created. Then suddenly things go awry. It almost seems like the calibrations are changing midway through a guide session, switching from a good calibration to a bad. I've cleared out all calibrations, recalculated the proper calibration step, slewed to the CE for optimal calibration results, etc. etc. I've got a good calibration at the moment...but...at this point, I honestly don't know how long it is going to last... I've never seen a problem like this before. Updating PHD2 to the latest (which I may have already had as I upgraded a few months ago or so) did not seem to change anything. Edited by Jon Rista, 17 March 2019 - 12:10 AM. I will confirm I too have the Pause during Autofocus enabled but PHD2 continues to guide. I tried toggling the setting to off just to see if maybe the option was in reverse, but no luck. I am running the most recent PHD2 dev and the non beta SGP stable version. The SGP 170 beta seems promising...lot of little things that annoyed the crap out of me before, such as the inability to plate solve an F&F frame to use the coordinates and angle for a target in a sequence...is now finally possible. Hopefully they will work out the rotator and guiding kinks soon. Edited by Jon Rista, 17 March 2019 - 01:08 AM. I generally leave the guiding on when running autofocus and have never had any issues. However, I have had a number of the random spiking issues in PHD as your graph displays. Some of the causes I have tracked down (after MANY hours of diagnosing) were cabling issues (tense cables when pointing to certain areas of the sky), wind spikes, having backlash setting enabled in PHD, having the EQMOD ASCOM PulseGuide Setting too low in one axis or the other (you can get a good calibration, but the PulseGuide Setting may need to be bumped a little), RA and Dec. locks on the mount need to be a little tighter and the scope needs to be re-balanced (maybe with a slight bias). I have had all of these cause random spikes at one time or another. The most common related to the balance and PHD backlash setting. However, I have also noted a number of instances where the cables tensed causing spikes in certain directions like the SW. I am not sure why you want to disable PHD when running AF. In my experience (at least with my equipment) running AF with PHD running results in a tighter AF result and a better V curve. Edited by Kaos, 17 March 2019 - 01:37 AM. The big spikes in my graph near the beginning are due to the AF, without question. I am using OAG, so every time the AF runs, the guider goes out of focus as well, and that screws with PHD guiding. As you can see in that first part of the graph from my original post, PHD ain't guiding well during AF! It's just freaking out, so it certainly couldn't be helping...in fact, I suspect it is making things worse since it is jerking the mount around trying to correct errors that are only temporary. The other spikes are due to dithers, which are normal. I've put a hell of a lot of money into configuring a system that has no cable drag issues or anything like that. I've had more than my fair share of such problems and I decided it was time they ended. Since moving to the Mach 1 and getting TTM cable routing going, I have not had any issues with cables. The new Mach 1's also have spring loaded worms, so they automatically adjust and keep tracking tight. Since the Mach 1 uses spring loaded worms, I don't use any kind of backlash compensation (tried it plenty in the past, all of that stuff is more trouble than its worth IMO.) Mount is balanced according to AP procedurs, and the guide rates are also set according to AP recommendations. It's the big jumble at the beginning of the graph that I have a problem with. Those always directly correlate with AF runs, and you can see the star profile drop out when it pushes focus out. It totally messes up longer term PHD reporting of performance, and I rely a lot on the PHD information to help me determine if things are operating smoothly or not. It looks like things are working now, though, and PHD is pausing during AF routines, and I no longer have any of those wild spots in my PHD graphs. Edited by Jon Rista, 17 March 2019 - 02:10 AM. I wish I could help. I have PHD2 2.6.5 and SGP 3.0.3.169 running and it works perfectly with pausing during autofocus. The only obvious thing is that the star will wander a bit during the pause because of my mount. Note that PHD will only pause during a running sequence, not when you manually call for an autofocus run. Were you observing this "no pause" behavior during a running sequence? Edited by buckeyestargazer, 17 March 2019 - 01:22 PM. So, this issue is the result of autoguiding freaking out as a result of discrepancies in the angle of rotation and the calibration of PHD2. When switching targets, or if rotation results in a 180 degree flip (which can happen), and PHD2's calibration is not updated, then there ends up being crosstalk between the axes in PHD2, and a sine-wave oscillation is the result. Should have figured that out before, but it was occurring randomly enough the other night that I wasn't sure why it was happening at all. Tonight, I calibrated PHD with my scope west side of pier, accidentally as I forgot to enable my custom meridian limit before my first slew to target. I then fiddled with APCC and must have enabled the meridian limit, centered on the object which of course resulted in a meridian flip on the first slew. When the target finally started imaging, PHD was in a major sine-wave freakout. Seems the 180 degree flip and slight angle discrepancy was the cause, and I had to re-calibrate PHD2. Sadly, SGP doesn't really seem to have a feature to validate PHD's calibration, or know that calibration might need to be re-done after a rotation operation occurs. It does have a simple option to re-calibrate when changing targets...but technically, in this case, it didn't actually change targets. Same target, but after centering the rotation changed. So it sounds like we SGP users may need a new feature to ensure that if the rotator angle changes, PHD is recalibrated. Hey Jon, when switching to OAG I also ran into issues so welcome to the club! Yes, the pause while autofocusing works, but I believe this happens when the sequence is running automatically. If you just started guiding manually and a sequence is NOT running but you click autofocus, I believe it will not pause guiding then because you are in a manual mode. You may also want to increase your search box (Setting in PHD) which I definitely needed, if the autofocus took too long and the star drifted slightly when it resumes there's no more star in the box! In SGP autoguide tab there is a "[x] Re-calibrate autoguider when target changes" Did you try that one? Edited by entilza, 21 March 2019 - 09:18 AM.